This amateur production of ?The Rise and Fall of Little Voice? is presented by special arrangement with SAMUEL FRENCH, LTD. This is a wonderful heartwarming northern comedy play about a shy reclusive girl with hidden talent.? Living alone with her larger than life and sometimes raucous mother Mari,? “little voice” escapes from her loud blouse mother to her bedroom where she immerses herself with her late and greatly missed father’s LPs. 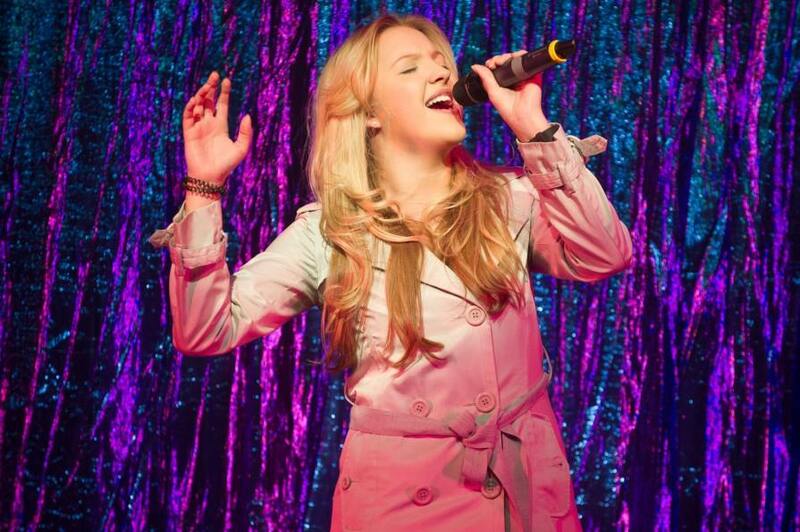 Here she discovers the voices of Piaf, Shirley Bassey, Judy Garland and many more. She discovers a unique talent to copy these sounds. Enter Mari’s new rough diamond boyfriend, and would be club agent Ray and Little Voice is in danger of being exploited in his ambition to make her a “star” and hit the big time. But will anyone ask Little Voice what she wants?? This award winning play by the incredibly talented northern playwright, Jim Cartwright mixes northern grit with Hollywood glamour, hilarious characters and iconic songs in this story of emotion and earthy comedy. PAINFULLY timid, Little Voice spends most of her time shut away in her bedroom, playing her late father’s beloved vinyl collection on a museum piece?of a record player. She’s so quiet in company you could forget she’s there, but beneath her mousy exterior lies a remarkable talent that nobody can ignore. 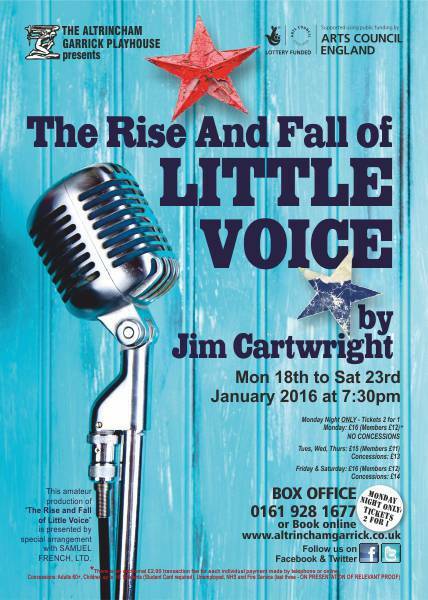 Altrincham Garrick launches its new season with a modern day classic, in the shape of Jim Cartwright’s The Rise and Fall of Little Voice. One of my favourite writers, Cartwright’s script is as laugh out loud funny as it is poignant and he makes you care about Little Voice, a fragile flower who also has a domineering drunk of a mother to contend with as well?as her socially debilitating hang ups. This is a tribute to Cartwright’s writing, the?direction of Peter Birch and the performance of Olivia Archbold as Little Voice. I really enjoyed?the way she?developed the character and I’m sure I wasn’t the only one willing her and the lovable Billy, LV’s male equivalent, to strike up a romance, It was like watching?a northern Romeo and Juliet, for the balcony we had this young girl’s bedroom window. These scenes, humorous and touching, were beautifully played by Olivia and Rob Dutton. Lise Banks was also very good value as LV’s mother, Mari Hoff, a good?time?girl whose appetite for the booze is as insatiable as her appetite for the men. I?use the word ‘girl’ in its loosest possible sense,?by the way. ?Lise also managed to make the awful Marie sympathetic and nowhere is this more evident when Mari is given a brutal dressing down by?the sleazy showbiz talent scout Ray Say (Andrew Higson). She looks like a wounded animal after Say’s verbal assault.By far?the funniest character is Sadie, Mari’s daft as a brush next door neighbour. No wonder Mari never has anything in her fridge as this good soul seems to be on a “see food and eat it” diet. While?this play isn’t wall to wall hilarity it provides an enjoyable start to?a gloomy time of year,?when many of us are coming to terms with eye watering post Christmas credit card bills. More Jim Cartwright at the Garrick, please. 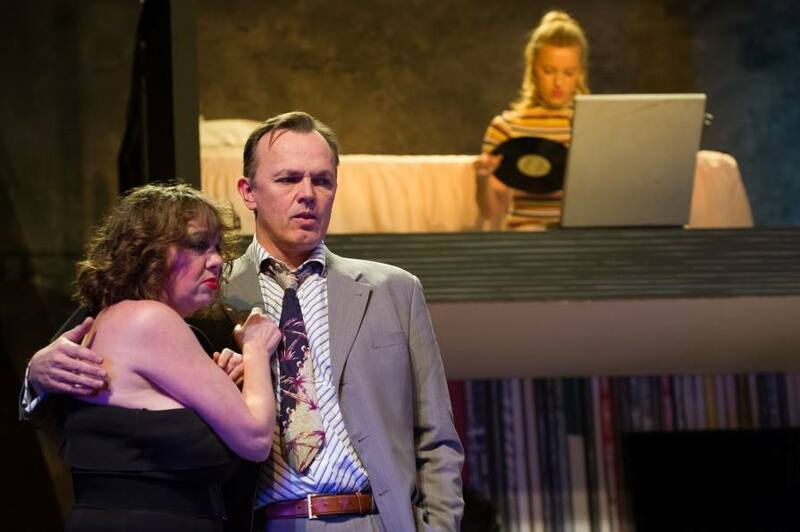 Written in 1992 by Bolton born playwright, Jim Cartwright, this play has seen success on the West End and Broadway stages with a great 1998 film version starring the original West End Little Voice of Jane Horrocks and Michael Caine. With such a progeny it is no wonder that many companies fight shy of producing the play these days, and so when one dares to stand up and be counted, it naturally produces quite a buzz. And who better than Altrincham Garrick to do just that; an amateur theatre company that thinks big and has lofty ambitions. I last saw the play myself in 2012 at The Octagon Theatre in Bolton, and so it was definitely time for me to reacquaint myself with it. The play is set in the early 1990s in a northern town not dissimilar to the one where you are now; we see a teenage girl, timid and unsociable, retreating into herself after the death of her father and her overbearing and rather out of control alcoholic mother, Mari, who neither understands nor really knows how to show affection to her daughter just compounding the situation and there is a rift between them. One keeping the house in a permanent state of untidiness with never any food in the cupboards, but plenty of booze in the drink’s cabinet; whilst the other keeps her bedroom spotless and tidy, and amasses a huge collection of records which she will sing along to and imitate the singers she hears, finding escape and solace there. When Mari starts dating a small-time talent scout Ray, and brings him home one evening; he hears Little Voice singing in the bedroom and realises that he has found a hidden talent and gets to work on bringing her to the local club to sing there. Ray has seen the pound-signs in his eyes and sees this as a ticket to his fame, Mari sees Ray as her ticket to a better life and clings on to him whatever the cost to her daughter’s health and happiness; and all her daughter really wants is to feel loved and be happy. It’s not going to end well! In this production I felt the first act worked better than the second. One reason for this was the set. In the first act, the play is set entirely in Mari’s house, and we were presented with a rather interesting and clever two-storey design with the kitchen and living room below and LV’s bedroom above. It was fitted with period furniture and appliances and looked very good indeed. I really loved the wallpaper of record-sleeve spines – an ingenious touch! The problems I did have with this though were that it was set on the revolve, and so it was a little too far from the front of the stage if the revolve was not being used – which it wasn’t, and the distinction between the house interior and exterior was often blurred and unclear, especially when characters had to go up or down the stairs behind the living room. There was an area of stage right which became both part of the house and also the path outside. In the second act though, the constant bringing in of the glitter curtain for the night club seemed to be less well thought through. There was absolutely no night club atmosphere, and the only addition to the curtain was a sunken area at the front of the stage where two tables had been set up for the cast to sit at and watch LV’s performance. I was sitting on the very back row of the raked auditorium and still was unable to see this to any great extent. The front row would have seen only the very tops of the actors’ heads. No attempt was made to create an ‘audience’ for the club and the whole thing lacked an atmosphere. It was sparse, minimalist, and after such a realistic and well-thought out first act set, it seemed almost as though you’d run out of budget and decided to simply bring in the tabs. Why wasn’t the revolve used? Surely that would have been better? The other criticism I have of the second act is that after the fire, which started well, but all too quickly got out of control and was far too big, happening in the neighbouring houses too, for such a little after-effect once the smoke cleared. The house should not get burnt-out, the upstairs rooms being damaged but not badly so, and downstairs being in cinders. However, once the smoke cleared on stage last night, we could see that a black piece of material had been used to cover the sofa, some more strands to cover the standard lamp, and a burnt kitchen table had replaced the original. Once again, after such a magnificent start in set design, this was a huge let-down. I simply did not believe this to be fire-damaged at all, nor that the cast were walking though after-burn smoke. They made no attempt at covering their mouths or coughing and spluttering as you would when faced with this in reality. The acting, at least from the three main principals was though absolutely solid and first class. Very wisely choosing not to try and imitate the famous performances that have gone before them, finding new and interesting nuances in the writing and bringing their own personalities into the mix to give three extremely well-rounded and bravura performances. Olivia Archbold, a very naturalistic actress, who did some rather credible mimicry of Shirley Bassey, Edith Piaf and others, played Little Voice; Lisa Banks played the last-chance lush Mari Hoff to comedic perfection, and Andrew Higson, the agent of no-hopers dreaming of the big time. His little asides showing us his true feelings about Mari were lovely and we enjoyed the complicity of this. These three were ably assisted by Rob Dutton, who played a young electrician Billy who becomes LV’s love interest and, through their mutual understanding of each other, builds up a lovely trust between them, their long silences extremely well played. Rosalind Ford is the friendly neighbour who pops in for a cup of sugar with some tea, Sadie; and Martin Oldfield is Mr. Boo, the owner of the club. It was a very good play and I enjoyed rekindling my enthusiasm for it. This though is now the third Garrick production I have seen in the last month or so, the first being Snow White, and then only last week watching The Price. Had this play been produced by any other society I would probably have given it 5 stars, however, after seeing what the Garrick is truly capable of, I can only put this production in a worthy third place.